Singing with the harp was undoubtedly a popular pastime amongst the common people in various parts of Wales during this period – in taverns and fairs and also in the early eisteddfod meetings. When I was a young 18 year old I was very fond of singing with the strings (harp). My teacher in this art was Sam the Taylor from Efenechtyd (near Ruthin). I was in the pub almost every night. Efenechtyd at the time was well known for its cerdd dant singers – Sam the Taylor, Huw Huws the blacksmith from Pwllglas, John Davies the sexton, and also myself. In the hope of getting some beer and food, and also a few shillings, to this competition came all sorts of babblers, revellers, balladeers, common bards, minstrels, gluttons, drinkers, drunkards – the dregs of the world and rejects of all kinds – so that this ancient and thoroughly Welsh tradition came to be regarded as something unworthy and distasteful….in the Madog Eisteddfod the screeching, blasphemy and swearing of the competitors was much more noticeable, in their attacks upon each other, than any regular and orderly competition of singing with the harp, all this despite the attempts of Talhaiarn (the compere at the time) to keep some semblance of order. The result of this, he goes on, was that the penillion singing competition was dropped from the programme of subsequent eisteddfodau. In the Caernarfon National Eisteddfod ten years later, rather than having a competition, three “well respected” penillion singers were chosen in advance, to entertain the audience. But the competition came back, and it is reasonable to assume that a great effort had been made by then to impose order and to get rid of the less unruly and disrespectful elements. One of the most popular competitions was ‘canu cylch’ – literally, singing in a circle. 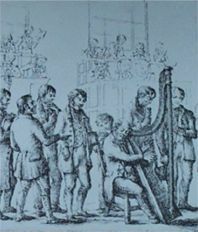 All the competitors (eight in the example below from the Powys Eisteddfod of 1824) would stand around the harp. There would be a draw to decide who would sing first, and the order in which the others would sing. The adjudicator and the harpist would between them decide on the melody, and while the harpist would play the melody through once, the first singer would decide what sort of verse would fit on that particular melody. The other singers would have to listen carefully to this singer in order to recognise the type of verse, because they would all have to follow suit. They would have to sing a different verse but in the same metre, one after another – and improvise the counter melody, of course. Anyone caught singing the wrong metre or failing to remember the words or failing to remember a verse on that particular metre would be eliminated from the competition. At the end of the first cylch (round) the adjudicator would change the melody and the second cylch would start. This time, the order in which everyone performed would change so that the next person down would now be the first. This particular competition was a test of the singers’ ability to improvise, and an even more severe test of memory. The competition could go on sometimes for hours. In a conference in 1934 it was decided formally to end this particular competition – probably because it was such a highly skilled art and such masters of the craft were by then few and far between. 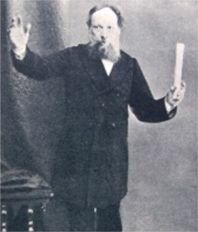 Idris Fychan – the cobbler from Dolgellau – won a competition for writing an essay on the History of Singing with the Harp – Hanes a Hynafiaeth Canu Gyda’r Tannau – in the Chester National Eisteddfod of 1866. Publishing that essay in 1885 was an imporant milestone in the history of cerdd dant. For the first time, a set of guidelines were proposed for anyone who wanted to learn more, an effort was made to create a set of rules, and he included several examples. If we look closely at his counter melodies, they either follow the notes of the melody itself or often stay on the same note for several bars. Idris Fychan concludes his essay by listing 64 of the main penillion singers of the day – a list which shows the leading role played by the districts of Mawddwy, Dolgellau, Penllyn and Edeyrnion (Merionethshire), and Uwchaled and Bro Hiraethog (Denbighshire) to the cerdd dant tradition at that time. 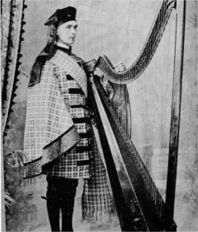 Dafydd Roberts was a skilled harpist and singer. He spent several years in Llanofer Hall, where he mastered the triple harp. 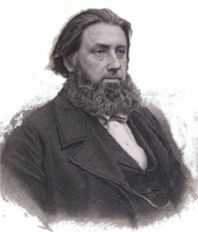 In 1911 he published a guide to cerdd dant entitled Y Tant Aur – reflecting, like Idris Fychan twenty five years earlier, the simple gosodiadau of his time. This book sold thousands and had to be re-printed five years later. The danger with too many penillion singers is that they recite their verses on a few notes, such as the tonic or fifth, and by so doing make their performance confined and monotonous. The changes made between the first and second edition of Y Tant Aur was a crucial turning point in the development of cerdd dant.